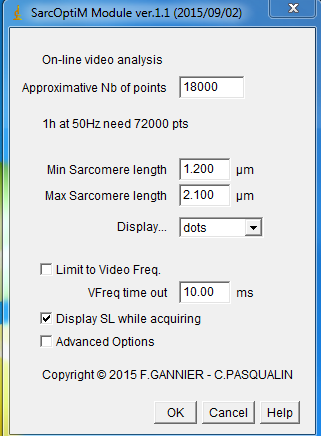 with "Limit to Vfreq" checked, this value MUST be COMPATIBLE with the video frequency, i.e., greater than 1/Vfrequency. with "Limit to Vfreq" unchecked, this value should be equivalent to the time between 2 frames, i.e., 1/Vfrequency. 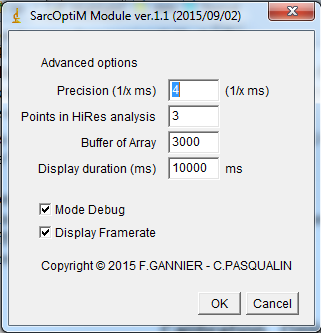 - Display SL while acquiring: Displaying points on graph during acquisition can limit the acquisition frequency. Uncheck to allow high frequency analysis and current SL displayed in the status bar. - Points in HiRes analysis: optimisation in SL determination, number of points used on each side around the maximum of the FFT spectrum inside the passband filter.